Archaeology is a dirty business. It’s an uncomfortable business. An archaeologist is often either too hot, too cold, too insect-bitten, too sore, too tired, or too thirsty. It can also be a grind – exciting discoveries are separated by long stretches of meticulous paperwork, and many times you do not even know what you have until you get to the lab. Many of the best “discoveries” for me have come weeks or months after excavations have ended. So what keeps us digging? 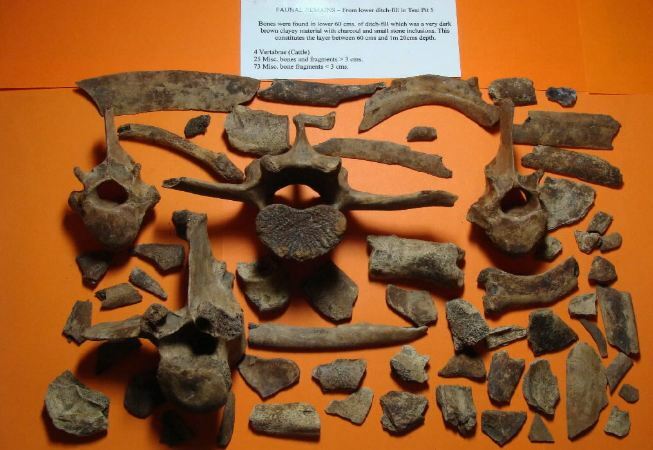 Domestic faunal remains similar to those found at the Royall House – representing basic New England farm fare. As a historical archaeologist, who has a vast set of written documents to supplement my research, the question is even more pointed: why dig? What can we learn about these people that we didn’t already know before? Aside from more obvious answers about “history being written by the winners” and such, it comes down to this: some of the most gratifying moments in scientific practice come when we have rigorously laid out, exhaustively researched, and contextually constructed a set of questions to go into a project with, only to be confronted with revelations about the past that are unexpected. Data that won’t go where we “wanted” them to can be even more gratifying than getting the answers we went in expecting. Surprise evidence and thwarted expectations force an archaeologist to open new avenues of inquiry. A historical archaeologist has multiple data sets of artifacts, landscapes, documents, and oral histories at their disposal. These separate lines of evidence do not all tell the same story, however, and are frequently contrastive. That is, there is often a “gap” between what documents will tell us about a site or a past historical phenomenon, and what oral histories, landscapes, and archaeological excavation will tell us about the same site or phenomenon, respectively. So while archaeologists go into a project with a certain set of expectations to guide their initial research, they must also “mind the gap” between and among their different data sets, for it is in that “gap” that many of the most interesting discoveries reside. Let’s take an example from the Royall House’s own excavations from 1999-2001. Historical documents reveal that there were important social, economic, and demographic differences between systems of slavery in New England and elsewhere, like the South or the Caribbean. Enslaved people had greater legal rights in the north; they were more likely to be in urban households than rural ones; more likely to be house slaves or skilled labor than field hands; more likely to be held in groups of three or four than scores or hundreds; and more likely to live and work in close proximity, often under the same roof or in the same business as, their masters. Unfortunately, these differences, while real, were often used to perpetuate a myth of northern slavery being a kinder, more family-like, form of servitude. Cotton Mather wrote in 1721, “Many of you would not Live near so well as you do…. Your Servitude is Gentle.” This characterized apologist attitudes of the day, and was carried on in modern historical scholarship about northern slavery through much of the 20th century. more “bargaining power” because it was less easily replaced. Also, the low number of Blacks in the community was thought to be less “threatening,” and so surveillance might have been less rigid. The Royalls’ estate documents also indicated that one or more slaves there were “trusted servants” sent on independent errands, and sometimes carrying considerable sums of money. Documents and archaeology conducted on slave sites in the South and Caribbean seemed to underscore the importance of this “free time” in the construction of identities and communities. 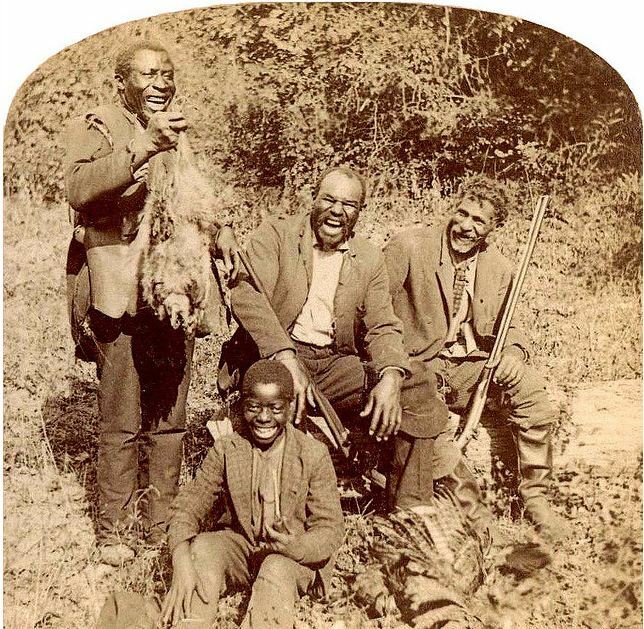 Plantation sites are often characterized by an abundance of wild animal bones, indicative of clandestine hunting parties, to supplement diets, provide for families, and forge important social relationships. It is also typical of plantation sites to find wild and domestic plant remains, indicative of foraging and an intimate familiarity with the natural environment, as well as the maintenance of private gardens, yielding produce that enslaved women could sell at market for their own financial gain. We had originally hoped – and even expected – that the floral and faunal analyses at the Royall House, too, would fit well within a discussion of the creation and maintenance of “private personae” and black community life in the quarters. We had no reason to assume otherwise. All historical and archaeological evidence thus far had pointed to exactly this. If anything, we thought we might see the pattern exaggerated in the North. But the plant and animal remains from this site suggest that the Royalls’ slaves were doing little or nothing to supplement their basic provisions, either through the exploitation of wild resources or the cultivation of domesticated ones. There was no evidence of a preference for stews or gumbos; no presence of small forest game, aside from a single rabbit; no evidence of fishing; only equivocal evidence of shellfish gathering; and few plant remains – a few hundred wild berry seeds. Both elderberry (left) and raspberry seeds were recovered from the Royall House Slave Quarters deposits. What this means is that while the varied and dispersed nature of northern slave labor would have provided opportunities to become autonomous in ways unknown among slaves in other parts of the Americas, the close living quarters and relatively low density of blacks in the region also gave northern slaves less freedom of movement in their environs, which must have been a great loss in autonomy. Indeed, since African-American folk culture in other areas is known to have sprung up and flourished in physically marginal areas such as fields and forest clearings and depended largely on enslaved people’s ability to get away from the plantation, the possibility that the Royalls’ slaves were curtailed in that kind of movement has serious implications for their ability to create and maintain social, cultural, and economic ties outside the bounds of the Royall estate. Whatever the legal differences, the practical limits of slavery, even in the North, were manifold and sometimes unimagined. This is what archaeology is for, and this is exactly why we keep digging. Alexandra Chan holds a PhD in Historical Archaeology from Boston University, based on her research and collaboration with the Royall House Association. She currently works as a private archaeological consultant in New Hampshire, and continues to be active in public outreach and education about the Royall House, archaeology, and the lives of early African Americans in New England.